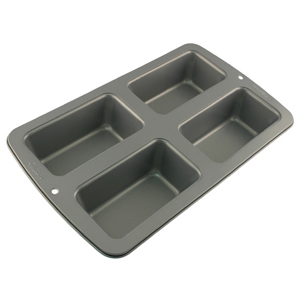 Brand: Wilton 2105-9101 Units: 1 Dimensions: 8¾" wide x 14¾" long x 2⅛” deep This four-cavity pan is non-stick and dishwasher safe. Each cavity measures 5 3/4" x 3" x 2 1/8". This four-cavity pan is non-stick and dishwasher safe. Each cavity measures 5 3/4" x 3" x 2 1/8".